Release Tuesday brings us Crysis 3, a continuation of the eye-popping graphic powerhouse series. If you've never played Borderlands 2, today's deal is worth a look. Crysis 3 launched today, February 19th. While there aren't really any price breaks out there, Amazon's $20 credit pre-order bonus is still available through Tuesday. The Xbox 360 and PC versions are the full $59.99, but you can grab the PS3 version for only $53.99 and still get the bonus. A new low on Borderlands 2 at Green Man Gaming for the Steam activated version at $19 after coupon until Wednesday 12pm Eastern. The previous low was $21 on December 27th for one day, but otherwise the game has rarely dropped below $40 since its September 18th release. Currently $59.99 on Steam, Amazon, and elsewhere. If you're a fan of the horror shooter series Dead Space, the 3rd installment is now $39.99 at Amazon across all platforms. A fair price drop for an AAA game that was just released earlier this month. Ni no Kuni is ten bucks off this week at Best Buy. That's the first legit discount since its January 22nd release date. A pretty solid drop on a well reviewed JRPG. 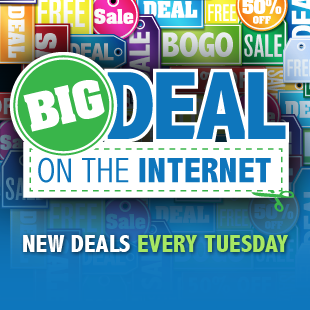 Check out the full list of Big Deals below, including bargain bin items such as PC downloads for 80 cents and "free" console games from Newegg after mail-in-rebate. Today's release, available at Amazon with $20 Amazon Credit bonus. Next best is $60 at NewEgg. Available at Amazon. Origin activated for PC download. Next best is $43 at Groupon. Deal expires today. For our friends across the pond it's down to Â£9.60 from Â£29.99. Next best is $40 USD at Amazon. Deal expires February 20, 12 PM EST. Steam activated version. Next best is $50 at GameStop. Deal expires February 23. Next best is $55 at Kmart. This is the lowest price we've seen yet for the PS3 exclusive. Also discounted in the UK from Â£29.99 to Â£21.60. March 5th release. Steam activated. Next best is $45 at Amazon. Deal expires February 22. Also discounted in the UK from Â£11.99 to Â£5.99. Steam activated. List is $15. Deal expires February 21. Next best is $5 at Amazon. Deal expires February 22. List is $4. Also discounted in the UK from Â£3.99 to Â£0.80. Deal expires February 22. Next best is $38 at JR.com. Next best is $35 at GameFly. Deal expires February 23. Next best is $48 at JR.com. Game is usually above $40 in price for the console version. Next best is $12 at GameFly. Free store pickup if available in your area. Next best is $12. Free store pickup if available in your area. Deal expires February 25. "Free" through a Newegg mail-in-rebate where you receive a $10 Newegg prepaid card. Next best is $200 at Amazon. Deal expires February 25. Not a bad deal considering regular non-XL MSRP for $169.99. Next best is $39 at Rakuten.